This story was updated at 9:38 p.m. EST. SpaceX officials called off the inaugural flight of their Falcon 1 rocket Saturday after a launch countdown beleaguered by poor weather, an engine computer glitch and liquid oxygen fill tank problems. "As I warned, the likelihood of an all new rocket launchingfrom an all new launch pad on its first attempt is low," said SpaceX founder Elon Musk in a written statement. SpaceX officials scrubbed today's planned space shot at about 8:00 p.m. EST (0100 Nov. 27 GMT), deep within a launch window that was extended to 10:00 p.m. EST (0300 Nov. 27 GMT) during the countdown. 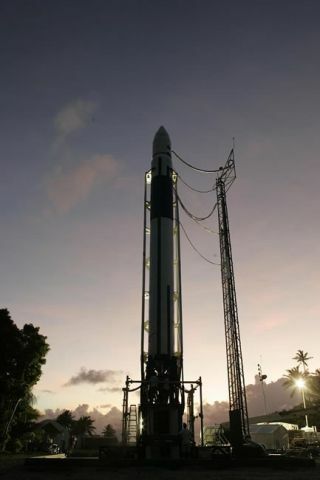 Musk addedthat the Falcon 1 flight could be rescheduled within one week, but would likelytake longer since additional liquid oxygen fuel must be delivered from Hawaiito the firm's remote launch site on the KwajaleinAtoll in the Pacific Ocean's Marshall Islands chain. Today'sattempted space shot was slated to orbit the FalconSat-2 satellite on a missionfor the Defense Advanced Research Projects Agency (DARPA) and the U.S. AirForce. The $800,000 satellite - built by cadets at the U.S. Air Force Academy -is designed to study space plasma and its potential to interfere withnavigation and communication satellites, U.S. Air Force Academy officials said. Thecube-shaped satellite measures about 12.5 inches (32 centimeters) per side andweighs about 43 pounds (19.5 kilograms), academy spokesman John van Winkle toldSPACE.com, adding that the spacecraft carries one miniatureelectrostatic analyzer to study space plasma. The ElSegundo, California-based SpaceX hoped to make itscommercial launch service debut with today's planned space shot. The firm hasspent about three years developing a family of Falcon boosters to grow from itsFalcon 1 design and Merlin rocket engine. "Unfortunately,in this business there is always a chance for something not to go [asplanned]," said Larry Williams, SpaceX vice presidentfor international and government affairs, as the countdown clock ticked down. SpaceXlaunch officials initially set a four-hour launch window for today's Falcon 1flight. Poorweather caused a one-hour delay early in the countdown, though an incorrectlyset valve on a liquid oxygen fuel fill tank led to a longer hiatus thateventually prompted SpaceX officials to extend theirlaunch window. But theloss of liquid oxygen - which boils away during launch preparations and must bereplenished regularly - was too great, SpaceXofficials said, adding that a main engine computer glitch also caused enoughconcern to reschedule the mission. SpaceXaims at providing low-cost launch services for both small and large payloads.Falcon 1 launches have a set cost of about $6.7 million, Musk said beforetoday's launch attempt. The firm's Falcon1 rocket is a two-stage booster that stands about 68 feet (21 meters) tall andcarries a reusable first stage. Its Merlin 1 engine is designed to generateabout 77,000 pounds of thrust and loft payloads of up to 1,256 pounds (570kilograms) into low-Earth orbit, SpaceX officialshave said. The rocketis the smallest in a planned SpaceX family of Falconlaunch vehicles, which includes the larger Falcon 9 rocket expected to boostpayloads of up to 20,500 pounds (9,300 kilograms) into low-Earth orbit.